Here’s a bread I make almost every weekend so we can have something nutritious to snack on when hunger hits. My multigrain, wholegrain bread is not just divinely healthy, it’s also one of the best breads you’ll ever taste– guaranteed. What’s more, it is totally versatile. 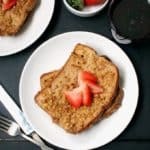 It works beautifully for sandwiches, makes the crunchiest toast you can imagine (the way we like it), and is great even with a topping of nothing but ol’ peanut butter and jelly. 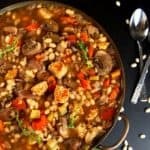 Over the past few weeks since I first came up with this recipe, I’ve tried shaping it all sorts of ways. As two loaves, one loaf, a loaf-shaped loaf, and a round, bulbous loaf. As you can see, I went with the last option this time, but they all work great. The best part of this bread is, it requires very little rising time– just two rises of an hour each. So as breads go, this one is quite an efficient guy. 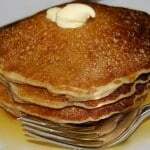 I usually add molasses to the bread which gives it a great taste and a great color. I didn’t this time, for no particular reason. 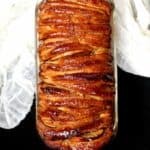 It was still wonderful, but if you’d like some added richness do use the molasses which is full of great nutrients like iron, calcium and magnesium, among other things. I’m going to keep this short, but for more advise on bread baking basics, refer back to this post. And find some of my other bread recipes here. 4 tsp active dry yeast mixed with 1/4 cup warm (not hot!) water. Set aside about 5 minutes or until the yeast starts to froth. Mix the water, soymilk, sugar, salt, molasses and oil in a bowl. Add the yeast to the soymilk mixture, then add the whole-wheat flour and the vital wheat gluten flour. Mix by hand or in a stand mixer until just combined. Then add the buckwheat flour and the rye flour. Knead for 10 minutes on low speed or by hand. Keep about 1/2 to 1 cup of whole-wheat flour on hand to add in case the dough is too sticky. You want a smooth, elastic dough that does not break easily. Oil a bowl and place the dough in it, turning it around once to ensure it is coated all over with oil. Set aside in a warm place to rise for an hour to 90 minutes. Remove the dough from the bowl, punch it down, shape. If you'd like to make it in loaf pans, divide the dough into two halves, tuck the edges under for a smooth top, and place in oiled loaf pans coated with some cornmeal. If shaping into a round, single loaf, as I did, place on a cookie sheet lightly greased and sprinkled with cornmeal. Let the loaves rise in a warm place for two hours. Bake in a preheated 450-degree oven for 10 minutes. Then turn down the heat to 350 degrees and continue baking for 35 more minutes. Remove the loaf to a rack and allow it to cool for at least 15 minutes before unmolding. For those of you who’ve been waiting for news on Lucy, she had her first session of chemotherapy last week. The side effects were minimal, and the site of her amputation has almost healed, so all in all she’s doing pretty great. I’ll leave you with a picture of Cannoli, my neighbor’s cat. Cannoli has sort of adopted our garden and loves rolling in the mulch. He’s even made little mulch angels in the ground! How cute is he? And here also is a picture of my darling Freddie, diaper and all. A gorgeous looking bread that packs quite a punch with all the wholegrain goodies in it. I happened upon your blog today and i am in love with it! 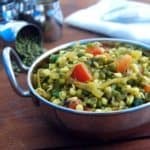 I am a newbie food blogger.. trying to to turn vegan(i switched from non-v to eggetarian with only ethically raised and pasture fed eggs and milk.) and i love animals !I am a dog foster parent with the humane society and a death row rescue in Seattle! Fostered 5 dogs till date, and found them loving homes! I am so happy that happened upon your blog! Lots of prayers for Lucy. She will be fine without a leg! i hope all the bad tumor cells go away and never return! Give her a hug from me and Chewie, my pom! Healthy bread to enjoy anytime.. Awesome click, was able to visualise the spongy inside. Thanks for the update on Lucy and glad to hear she is coping well. Hey Vaishali, I am one among your readers who has started to scan your every post of late to look for news of Lucy. As the post opens, I wish for happy news and I am very relived to hear today that she has minimal side effects from chemotherapy. All the best to Lucy and the family! Best wishes and prayers……. Lovely sight to watch Freddie and Cannoli.I never tried baking bread.This is an easy one to start with I guess. Vaishali, bread looks awesome. I love cats, so cannoli is so cute to me. I am glad Lucy is doing better. Is this 1 cup vital wheat gluten or typo? I have never seen a recipe which calls for that much gluten in the past 5 years of bread baking. Curious to know. Richa, welcome and thanks. Glad to meet a fellow animal lover. Kudos for all the great work you’re doing with animals. Lexi, yes, the gluten is vital in this case because otherwise the bread would be too dense and heavy, like a rock. Wholegrain flour usually has less gluten than, say, all-purpose or bread flour, and gluten is what creates the airy structure of the bread. 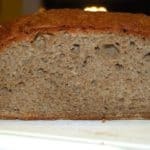 If you don’t want to use vital wheat gluten or don’t have access to it, I’d advise substituting about half the flour in the recipe with bread flour. BangaloreBaker, yes, you read it right– you do need a cup of vital wheat gluten flour for this recipe. 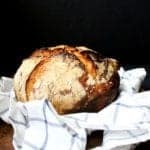 It gives a huge protein boost to the bread because as you know wheat gluten has tons of protein, and it also creates a really great, airy structure for the bread. The bread looks great! I love the colour. My breads don’t turn this brown. This is a nice bread. I don’t have to imagine the taste, reading the recipe can just give me the whole idea. Thanks for sharing this one. There are also many interesting bread recipe at foodista (http://www.foodista.com) for those people who like baking, you can check out the website and enjoy. A and N, It’s all those grains– rye in particular gives bread a fantastic color! Also molasses, which I recommend adding, makes the color even richer and more beautiful. wow, lovely bread. Perfectly baked. Yum!! That’s a gorgeous looking loaf. Love the deep brown crust. My bread making season hasnt started yet, waiting for the weather to warm up. Will surely give your a try. Very happy to know Lucy’s ia doing great. That must be a big relief. This looks incredibly delicious! Unfortunately we dont get rye in India and unfortunately there is no acceptable substitute for the deep rich flavours of rye. Glad to hear Lucy’s doing well! That cat is too cute. This bread looks extremely good. I don’t like eating store bought bread, but when i bake my own it is gone in less than a day. I am addicted. I love the color, even without the molasses. I guess the buckwheat has got to do with it too. I loved the crispy, brown, nutritious healthy bread!!! I am surely gonna try it this weekend. 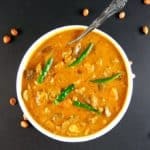 Ô Vaishali maana, Deu borem korum. I’ve always loved cooking and do quite a bit of it when I have the time. However, it is only recently that I started baking. Six years ago, I had got my wife to bake pão for me and for some reason or the other they never turned out tasting the same as our oondé. Probably, because she uses the bread making machine. Anyway, not having any baking experience myself, I nagged at her to try it by hand kneading the traditional way. She never did! So come early November 2010, while she was out at the park with the kids, I decided that I shall try my hand at baking, and if it misfired I could easily dispose of all evidence of my misadventure. So I surfed on the web, found VahChef Sanjay’s excellent pav video tutorial and decided to give it a short. Voila! A few hours later, I had 14 excellent oondé, smelling and tasting right. Just like our poder used to make them. So, I quickly whipped up a suki batat bhaji to go with it. The wife and the kids got home and wowed at my pão, washed up, sat down for lunch and relished 13 of them with the bhaji. She admitted that my pão tasted better than her machine made ones. From thence, started my bread baking passion. Since November, I now bake three loaves on the weekend which last us the whole week. I do it by hand and get a good work out. I even had a go at 100% whole wheat pizza dough. Since, we do not get vital gluten here, my 100% whole wheat bread turn out a bit, but not too, dense. I have been putting off buying the much acclaimed Peter Reinhart’s Bread Baker’s Apprentice mainly because it is not available here and I need to order online and am always a bit hesitant to use my credit card online. So in the meantime, I have been scouting for good recipes on the web and stumbled on your site. Also, found a good recipe for 100% WW bread at http://homecookinginmontana.blogspot.com/2010/01/peter-reinharts-100-whole-wheat.html. Tried it last week with good outcome. Just before Christmas I bought us a pasta maker and have since then made fettucine and spaghetti. khuxeal borit novem voros tuca anvdettam. Hi Goemkar, Your adventures in baking sound fascinating. I love homemade bread too, especially pav, and I agree it tastes better than anything store-bought. A pasta maker has been on my wish list for a while– I can only imagine there must be nothing better than homemade, fresh pasta. Thanks for your comment, and welcome to Holy Cow! Here’s wishing you a new year filled with more wonderful baking adventures! 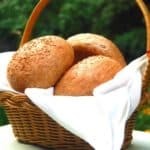 I am new to making bread and found your website while looking for some multigrain bread recipes. 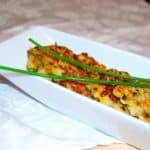 I know this may seem odd, but is it OK to cut the rye out of the recipe, or at least substitute it with something else? My wife does not like the flavor of rye at all and since I am going into this whole baking madness I think making her happy would be a good idea. I know you said to not change the recipes until I mastered them but is there anything that can be done? Thanks! I made this (and 4 additional loafs). I didn’t have any gluten so I subbed KA bread flower. I think the molasses really makes this bread tasty! All the loafs turned out really well. I am happy with my first bread making experience! Thanks for this recipe! 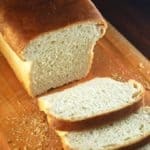 This bread is delicious I now make it every week, thank you for this recipe. Question; is the second rise when it is in the oven baking? Hi Sarah, the second rise is before it goes in the oven. I wasn’t clear in the recipe– I have added the instruction in. Thanks for pointing out, and glad you like the bread.